His final page recounts the last time they met. “How are you for cash?” Burton asked him. He always did this and this time handed him a stash of notes. When Munn stepped outside the studio he found they came to £500. The relationship certainly was true and many paragraphs begin “Rich told me..” He is often in the company of his most regular source, and frequent reference, Brook Williams, son of Emlyn. Munn knows cinema and he is generous in appreciation of the film roles. If he is blisteringly honest about “the Klansman” he applauds “Beckett”, “the Sandpiper”, “the Night of the Iguana” and even “Cleopatra.” The six hour version is a piece of cinema restoration that, if accomplished, will reveal it in its true fullness. He cites the best film critics, Judith Crist and Pauline Kael, economically but always fairly. His is not the view of the uncritical fan. There is an irony in his description of “the Spy Who Came in from the Cold”. 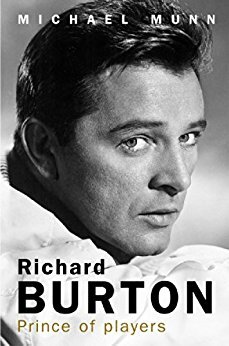 Burton was unhappy with the whole approach of director Martin Ritt in what is usually regarded as his most durable film. Philip Burton propelled the young actor to Oxford. Munn quotes Nevill Coghill's student record card “This boy is a genius and will be a great actor.” It would not be written this way today but it continues “He is outstandingly handsome and robust, very masculine and with deep inward fire, and extremely reserved.” The last is a surprise after various tales of youthful escapades. In the film industry women feature heavily. Munn is with Burton and Brook Williams in 1978. An affair with Marilyn Monroe is his enquiry. “How the bloody hell did you know about that?” asks Burton followed by “Bloody Ava Gardner! She always knows too much.” Then follows a page of quotation which, if its transcription is accurate, means that a tape recorder must have been present. The friend-reporter role is ambiguous. The most revealing aspect of Munn's book is the degree of pain that Burton suffered. It is known that in late life he had to undergo a perilous operation for a spine coated in crystals of alcohol. The alcohol had a cause. It had started, Munn says, when a prank of a laced drink caused the student Burton to fall down a staircase. The event was the cause on and off of pain for the rest of his life and Munn records later effects on stage and film sets. Munn extrapolates the scene to Burton admitting a history of attacks. Munn wonders about epilepsy. “Is that what it is, do you think?” says Burton to the twenty-three year old. “I'm too scared to want to know.” Munn says Burton said that he drank for fear of seizures and in the belief that alcohol was a preventative. If the story is genuine it adds an element of fear to an already known life of volatile but haunted brilliance.